Welcome to the mascil toolkit, designed to support the delivery or facilitation of professional development for teachers of mathematics and science. Mascil supports teacher groups working to improve their teaching by adopting inquiry based learning (IBL) practices that connect with the world of work. The toolkit is designed to support teacher groups by providing a set of flexible resources that will help them explore new and innovative teaching practices. It can be adapted and used in different ways so that groups can work on particular aspects of teaching that they have prioritised, or it can be used to provide a more structured training course. The mascil toolkit has three domains and within each one of these there are a number of key issues. 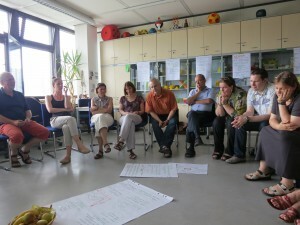 Each issue leads to a number of questions which are addressed by a series of professional development tools. The three domains are listed below and the following diagram then provides an overview of the structure of the toolkit with the domains on the left, the issues in the centre and the questions on the right. WAYS OF WORKING: explains how to use the toolkit as well as providing tools that will help teachers consider ways of working together effectively as a group and using cycles of inquiry that involve classroom teaching, discussion and reflection. INQUIRY and IBL PEDAGOGIES: provides support for teacher groups in exploring all aspects of inquiry in classrooms. WORLD OF WORK: supports new ways of teaching mathematics and science that connects with the world of work. It draws on the mascil classroom tasks that have been collected from across Europe to assist with this. Ways of working Working with mascil resources How do I navigate around the toolkit? For most questions there are professional development tools that you can use when working in a group to answer these questions. A full list of these can be seen by using the link here to the TOOLKIT. Each part of the toolkit is accessible by clicking on the domain title, issue or question in the diagram above or by using the drop-down and fly-out menus at the top of the page. To get started read the “Ways of Working” page.